For millennia, folks have been rustling up saffron recipes, using it to dye their robes, making perfumes, potions and ointments and for the many health benefits. Today the expensive saffron spice is, in the main, used to enhance and flavour food. Saffron Recipes - Fresh and Delectable! 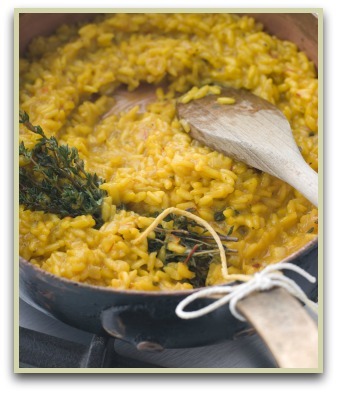 In Italy the infused threads are used in the famous Milanese risotto and it's an essential ingredient in a traditional Spanish paella. In India, you'll be served delicious curries and savoury breads laced with it. And in France you may order delicious tagines and bouillabaisse. You can even make a healthy cup of saffron tea! Although not quite the traditional Spanish version, why not try this healthy paella recipe which uses saffron and quinoa. More than anything, I tend to use the threads when cooking plain rice. They give a delightful, light flavour, aroma and colour to what can be a fairly bland dish. Click here for my easy-to-make saffron rice recipe. Store in an airtight jar out of direct sunlight. Use within 3-6 months before making a fresh batch. To extract more flavour, lightly toast the cloves, cardamom pods, cumin, caraway, nigella and peppercorns prior to grinding. This helps release their flavours and aromas. See the cooking with spices page for "step-by-step" info and photos on toasting and grinding. Crocus Bulbs - It takes 75000 bulbs to produce a single pound of this spice!